To help determine a listing price for your home, we can provide a CMA or Comparative Market Analysis from the MLS. A CMA compares your home with similar homes in the area that are currently listed, under contract, or have sold within the last year. Of course, every house is different, with updates, nicer appliances, modern building materials, and more. We will always recommend getting an appraisal for unique homes, but the best way to help determine your listing price is to go to Realtor.com and “shop” for your home. Type in your area and suggested price range, and see what the other buyers would see if they were looking for your house. At Don Anthony Realty, we do EVERY listing from your home for a few reasons. First of all, we want to get to know you since we will be representing you throughout the negotiation and closing process. Since we can list your home using our wireless Internet connection, your house may even be LIVE on the MLS BEFORE we leave. We want to make sure you are 100% happy with your listing before we post it if at all possible. Finally, we will do a complete walk through of your house with you and recommend staging techniques, paint colors, and how to de-clutter. Home Staging is so important in today’s market, and it’s helpful to have an agent that sees several houses a week give you advice on home presentation. The listing process will typically take between 1 and 2 hours. 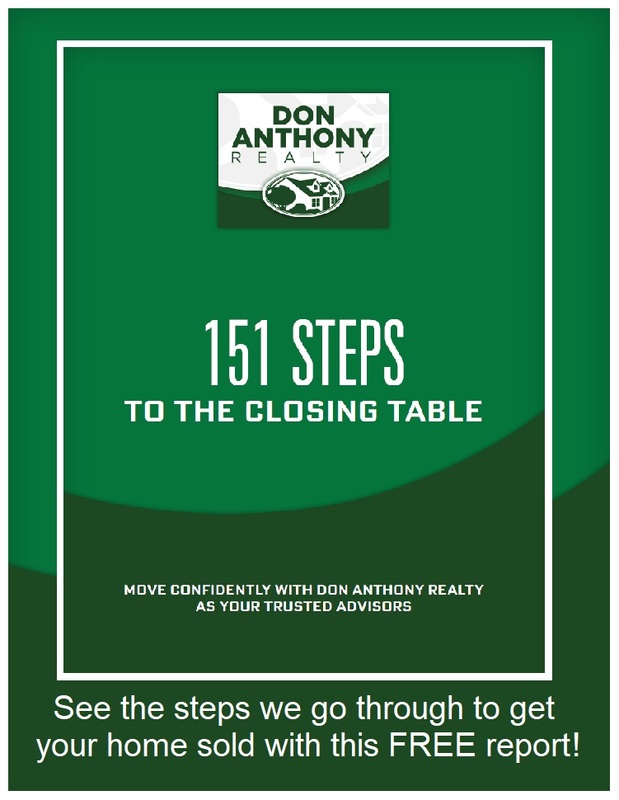 During your scheduled appointment, a Don Anthony Realty listing agent will go over the state approved listing agreements and disclosures so that you fully understand what you are signing. We will also go through the MLS Listing with you line by line, so that you are happy with the information we are putting towards the public. When the listing information is complete, we accept Cash, Check, Visa, Mastercard, American Express, and Discover. Once the listing agent gets back to the office, our staff will load your pictures to the MLS and will post your home on all the other websites we promote your house on. When your Don Anthony Realty Listing Agent enters your house into the local MLS, they will have to enter a Buyer’s Agent Commission. The Buyer’s Agent Commission is paid when the house sells and is paid to the agent who brings your buyer. With Don Anthony Realty, you do not have to pay a buyer’s agent commission if you find the buyer on your own (open house, FSBO ad, friend, etc.) or if your buyer comes without an agent from the advertising we do for your house. Since many buyers are searching for homes on their own, this could result in saving thousands!